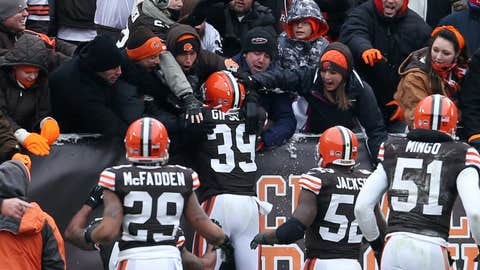 Cleveland Browns free safety Tashaun Gipson celebrates with fans after scoring a touchdown on an interception against the Chicago Bears during the second quarter at FirstEnergy Stadium. The Browns’ loss to the Bears on Sunday seemed all too familiar to our Zac Jackson, and he was not the only one to feel that way. Zac I am an old Browns fan dating way back to when the Browns won the championship back in 1964. I was at the game. Several of the Cleveland Browns lived in the city where I resided (Aurora). This team is just too disheartening; I almost wish that they wouldn’t have pushed to have a Browns team/franchise come back here because every year it’s the same old stuff (and we just cannot attract a premier-like coach, Gruden, Cower, or the likes, to come here). We get journeymen, 1st timers. I don’t believe that anyone wants the Browns on their resume, it’s like changing deck chairs on the Titanic, the last 14 years. Very sorry state of affairs (One thing that I do like is the new management, but I still haven’t bought in emotionally, though). Can you blame me? Can you blame others?